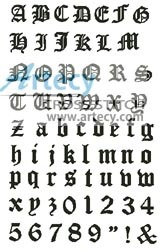 Olde Alphabet small Counted Cross Stitch Pattern to print online. This counted cross stitch pattern of an Olde Style Alphabet is useful to personal your cross stitch projects. Finished size = Capital letters in stitches are approx 37w x 38h, small letters are 21w x 31h.